This chapter covers using LVM volume groups as storage pools. LVM-based storage groups provide the full flexibility of LVM. Thin provisioning is currently not possible with LVM based storage pools. Refer to the Red Hat Enterprise Linux Storage Administration Guide for more details on LVM. 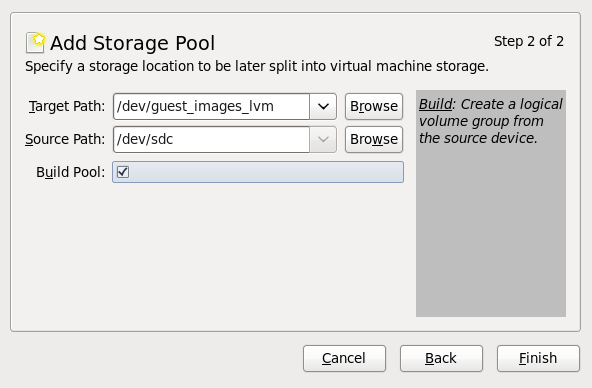 LVM-based storage pools require a full disk partition. If activating a new partition/device with these procedures, the partition will be formatted and all data will be erased. If using the host's existing Volume Group (VG) nothing will be erased. It is recommended to back up the storage device before commencing the following procedure. 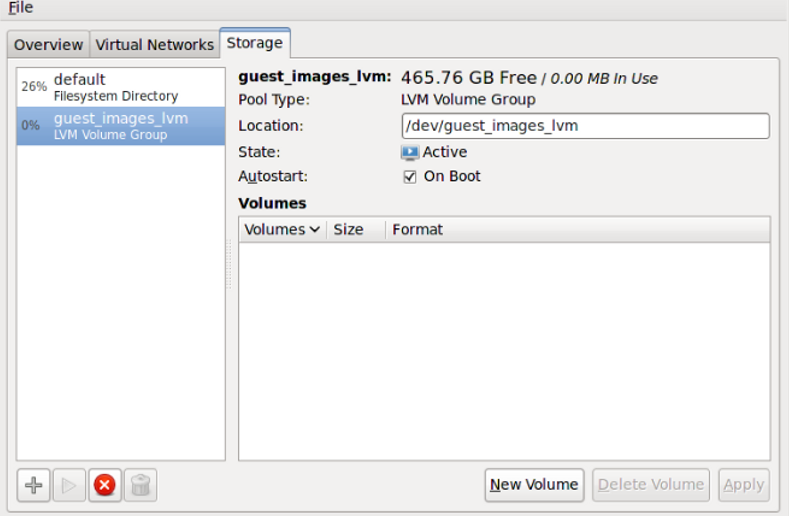 LVM-based storage pools can use existing LVM volume groups or create new LVM volume groups on a blank partition. These steps describe how to create a new partition and LVM volume group on a new hard disk drive. This procedure will remove all data from the selected storage device. Use the fdisk command to create a new disk partition from the command line. The following example creates a new partition that uses the entire disk on the storage device /dev/sdb. Press n for a new partition. Press p for a primary partition. Choose an available partition number. In this example the first partition is chosen by entering 1. Set the type of partition by pressing t.
Choose the partition you created in the previous steps. In this example, the partition number is 1. Enter 8e for a Linux LVM partition. write changes to disk and quit. Create a new LVM volume group with the vgcreate command. This example creates a volume group named guest_images_lvm. 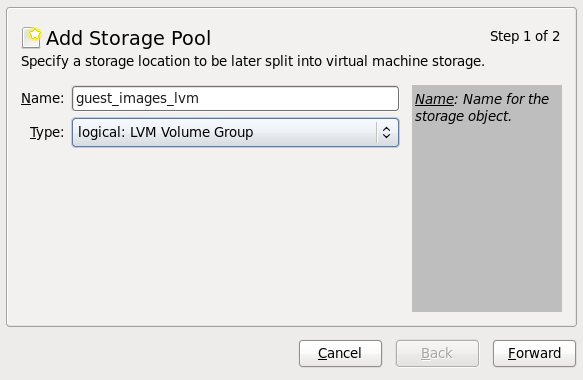 The new LVM volume group, guest_images_lvm, can now be used for an LVM-based storage pool. In the virt-manager graphical interface, select the host from the main window. Change the Target Path field. This example uses /guest_images. Now fill in the Target Path and Source Path fields, then tick the Build Pool check box. Use the Target Path field to either select an existing LVM volume group or as the name for a new volume group. The default format is /dev/storage_pool_name. This example uses a new volume group named /dev/guest_images_lvm. The Source Path field is optional if an existing LVM volume group is used in the Target Path. For new LVM volume groups, input the location of a storage device in the Source Path field. This example uses a blank partition /dev/sdc. The Build Pool check box instructs virt-manager to create a new LVM volume group. If you are using an existing volume group you should not select the Build Pool check box. This example is using a blank partition to create a new volume group so the Build Pool check box must be selected. Verify the details and press the Finish button format the LVM volume group and create the storage pool. Press the Yes button to proceed to erase all data on the storage device and create the storage pool. The new storage pool will appear in the list on the left after a few seconds. Verify the details are what you expect, 465.76 GB Free in our example. Also verify the State field reports the new storage pool as Active. It is generally a good idea to have the Autostart check box enabled, to ensure the storage pool starts automatically with libvirtd. Close the Host Details dialog, as the task is now complete.